I belong to a guild, The Northeast Feltmaker’s Guild (NEFG for short). This year marks the 10th Anniversary of the Guild. When I first joined, (which seems like a million years ago) things were very different. For me, and for the guild. Felters were few and far between then, and I was a part time feltmaker with a full time job working at an art museum as a Collection’s Manager. I had become good friends with the museum Director’s new assistant. She had sheep, she was confident enough to wear corduroys and a turtleneck to work, and she was a transplant from Manhattan in Washington County. She used to sneak off to meditate under the stairs in this little secret alcove during her lunch break. She created fantastic needle felted figures with a lot of personality and wit. Just like her. She knew I was a felter too, and she invited me to go with her to a meeting of her felting guild. We drove a long way to an old church that housed an arts center, it was West Sand Lake. It was almost all women, and they had brought their projects to felt on in the big room. We brought bag lunches, and there was a show and tell period at the end of the afternoon. Those felters were making some amazingly creative and well executed things. It was not a big group, maybe 15 or fewer, but there weren’t a lot of feltmakers around then, not in the northeast of the US anyway. It was a pretty cool thing to see. I didn’t go to all of the early meetings- it seemed like a long way to me, to travel just to felt with a group. Not long after that, the guild really started to evolve. There have been a number of dedicated people involved in the guild’s success. Today we meet three times a year for a weekend, every meeting has a very well organized program specific to felt making on day one, followed by a business meeting on day two. Members take seriously their commitment to attending the business meeting, not just bailing after the fun stuff. I think we realize that the group can’t function or flourish without the effort of the membership. This year we presented our second successful NEFG Exhibition at the Lower Adirondack Regional Arts Center, and we have organize five member exhibitions so far. We boast a membership of 116, stretching out all over the Northeastern US. This weekend we expect 41 members for the program, which is a good turn out. I think if it were not for the inspiration, knowledge, and professionalism of the NEFG, I may not have Luckystone Feltworks Studio today. I certainly wouldn’t know as many artistic women, and I wouldn’t be part of such a warm, funny, creative, sharing, supportive network of feltmakers. And I would have had far fewer gourmet meals, philosophical discussions and pajama parties. This entry was posted in Linda Van Alstyne, Luckystone Studio, Northeast Feltmakers Guild, Nuno Felt, Wet Felt. Bookmark the permalink. Oh, I just loved this post Robin…I think that I will just have to move to the Northeast;-))) Sounds like such a great group, and you have so many talented feltmakers. Look at all of you in your studio…Makes my head spin the talent in that one room! Thanks so much for sharing Robin. Nicely said Robin. NEFG is a wonderful organization. I love the workshops and meetings. 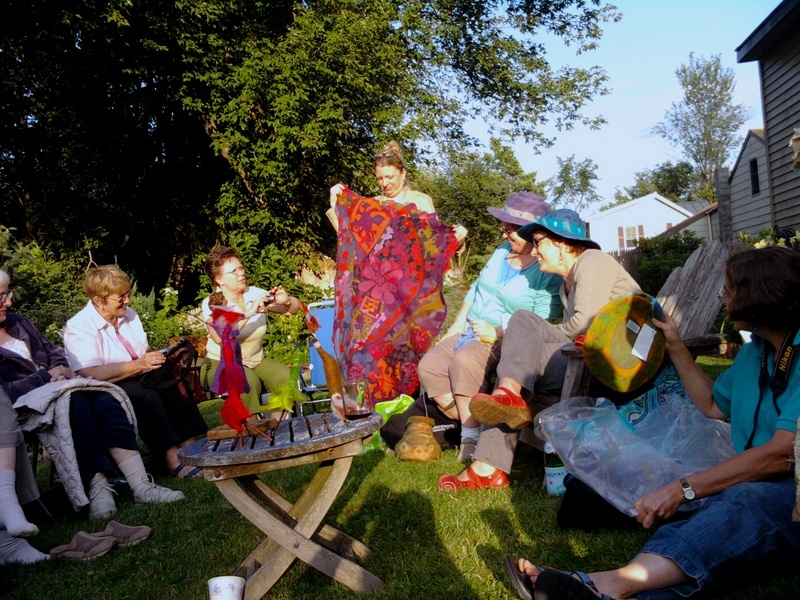 The best feeling is working in the same studio with many interesting women tirelessly felting like crazy!